The Edinburgh Renaissance Band is a group of 12 Edinburgh-based musicians specialising in the performance of music from the period 1200 - 1600. 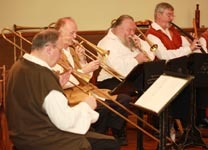 The Band has delighted audiences of all ages since its formation in 1973, playing Renaissance and Medieval music from many parts of Europe, including the important Scottish repertoire. The Band is noted for the wide variety of instruments used - from a selection of over 100. Since its inception the Band's aim has been to present informative and well researched programmes with a characteristic blend of informality and musical authenticity - making "early music" easily accessible. The sounds of the Band are many and varied ..... the sonority of the sackbuts and cornetts, the clear, loud tones of shawm and rauschpfeife, the sweetness of recorders and gemshorns, the subterranean buzz of rackets, the serenity of viols. All of these are attractive in themselves. Add to them voices - soprano to bass - and extensive percussion, then you have the phenomenon which is the Edinburgh Renaissance Band. The Band's audiences are attracted again and again, not only by the range and variety of its repertoire, ranging from monophonic medieval dances to multi-choral Venetian canzonas, but also by the versatility of its presentation: the Band is equally at home giving a late night Festval Fringe show, a party of Christmas music and dance, a period ball or a medieval banquet, or a concert. The Edinburgh Renaissance Band also performs in conjunction with the Edinburgh Early Dancers, when the vitality of the music is accompanied by the splendour and colour of the dancers performing in period costume. The Band organises its own series of concerts in Edinburgh each year. Highlights are the Edinburgh Festival Fringe shows and the very popular family Christmas concert. 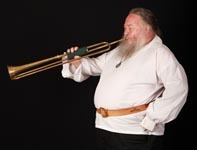 It has also played at early music festivals both in the UK and abroad. Specially devised programmes aimed at introducing audiences to the instruments and repertoire of the Renaissance are available, and special programmes can be provided to meet individual societies' requirements. The Band has extensive experience in providing music suitable for receptions and banquets, including ceremonial fanfares as required. Ensembles of any size can be provided, from two or three musicians up to the full splendour of the complete Band. Generations of children have been introduced to the delights of early music and the fascinating diversity of the instruments through the Band's activities, including school visits and special concerts for young people. Audiences are always delighted to see the Edinburgh Early Dancers perform some of the historical dances that are part of the Band's large repertoire of early music. 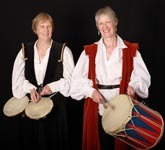 Dance workshops provide opportunities to learn some of the dances and the Band has organised several highly successful medieval balls. The Band is available to play at most events requiring Early Music and, through the Musical Director Professor Murray Campbell, will provide programmes specially researched and tailored to a particular place or period. 23 Queen's Crescent, Edinburgh EH9 2BB, U.K.